What do you do when one of your favorite serving plates falls off a stack of plates, smack into the middle of your head, bounces off the counter and shatters into a million pieces after barely missing your feet? Well, if you are me, you take it as a chastisement from above for procrastinating over posting your entry for Jihvā: Greens. On May 1 2007, it will be a whole year of watching and drooling over Indira's Jihvā for Ingredients, one of the most successful online events that celebrates the various ingredients we use in our cooking. On the eve of the anniversary, I raise a toast to Indira and 11 other entreprising hostesses and several hundred creative participants! Thank you all very much!! So with a huge bump on my head, a slowly progressing headache and eyes that are beginning to have a tough time focusing, I bring you what can only be called Green Chutney Redux! An hors d'oeuvre that rocks! Thaw the chutneys and the additional green chili-cilantro cubes and mix them well. Drain off as much excess liquid as possible. This is important otherwise your pastry sheet could quickly become soggy. Dust your work surface with some all-purpose flour and roll out the thawed puff pastry till it is about 1/8th inch thick. If this proves tricky, stop rolling before the pastry tears! Spread the thickened chutney mix liberally over the pastry. Start rolling from one side. Roll tightly until you have a firm log. 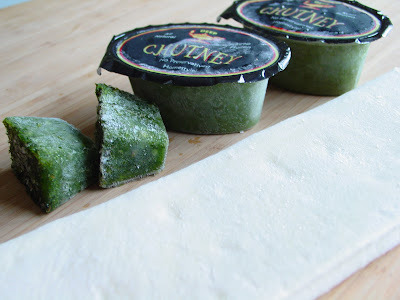 Wipe off excess chutney that may ooze out from the edges. Wrap this in plastic wrap and place in the freezer for about 10 minutes. The log will become firmer, making it easier to cut into thin spiral slices. Set a timer so that you don't end up with a rock hard frozen log! Slice into 1/2 inch pieces along the cross-section. I end up with about 25 slices depending on the thickness. Don't make them too thin or too thick. Place them on a baking tray or cookie sheet about an inch apart and bake for 12-15 minutes till golden-brown. Some will balloon up in the center, looking very much like a Mexican hat! Resist the temptation to dig into them immediately as they are very hot and will burn your tongue. Experience speaks volumes here! Allow to cool and enjoy with your choice of a drink, hot or cold. Needless to say, the star ingredient in this is cilantro. The essential oils of the cilantro leaves contain antibacterial properties and can be used as a fungicide. For a Thanksgiving party many years ago, I made two logs: one with cilantro chutney and the other with cranberry-jalapeno-orange chutney. It made for a very colorful hors d'oeuvre! I am rushing this over to JFI-Greens: Jihva for Ingredients, hosted once again by Indira as a joint event with Nandita's WBB before the doors close on the month of April! Indian Snacks, Spicy Spirals, cilantro, Coriander, Green Chutney. And what are we in India to do - make our own puff pastry? Only a matter of time before Pillsbury is making that here, I bet! We already have Pillsbury brand atta! Ouch Manisha, did that accident happen after you were through three-fourths of whatever was in that glass? :-). Hope your head is okay now. Those spirals look great, I like coriander, but the cranberry-jalapeno-orange chutney sounds much more interesting... if it is homemade, pleeeease post a recipe! Manisha, sorry about the plate... what was the brand and pattern name? Amazing!!!!!! And it would be great experimenting it will different chutneys!!!! Hope that bump is better Manisha - pour yourself another glass and I am sure it'll go away! This chutney spirals are pretty neat. 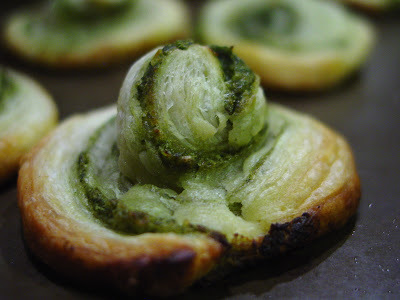 A cool Indian take on the Italian spirals I had made last year - I used pesto. I just love your idea and think will have to giveit a go! This looks really good and gives me lot of ideas now. Hope you are okay now? hey, spirals look Yum-O! yes that timer tip is very handy, I'm so used to setting up timers left & right ;-) that puff pastry is so versatile, both for sweet & savory stuff!! Those spirals look good and Thank you for a very enterprising use of the cranberry chutney. take care, hun. that sounds scary. there's an e-mail for ya. He Manisha, I liked your idea a lot and def'tly a crowd pleaser and looking at your recipe, I am getting lots of ideas too. Thanks for sharing this wonderful idea. Hope you are doing well Manisha! Lovely take on the spirals. Will give it a whirl oneday. Thanks! The plate is probably irreplaceable. My head hurts though. My husband was kind enough to tell me that perhaps this might finally 'fix' some things inside my head. The bump has subsided but the pain is raditating out into my neck. I thnk I should be fine soon. Thank you all for your concern! Anita, I used to make my own puff pastry. I don't have a ready recipe on hand but look here. But Coffee says it may be available in India. I realized just now that the brand is Pepperidge Farm Puff Pastry and not Pillsbury. That's what you get when a plate goes bonk on your head. I updated my post to reflect that. I threw the outer carton but will check to see what is in it on my next visit to the grocery store. What is real? I am not entirely sure anymore. Especially since I found out that Kraft is not real cheese. We made butter from heavy whipping cream yesterday on our field trip to The Four Mile Historic Park in Denver. Maybe that is real. It sure was delicious! Sig, I was drinking lychee juice, unspiked. I should have spiked it, I tell you! These things happen to me only when I am not drinking! The cranberry-jalapeno-orange chutney was homemade. I'll look for the recipe for you. Pel, these spirals were quite jinxed. I had a bunch of super pictures but I lost those when my computers went on the blink recently. These are great for parties and it really isn't any hard work at all. I don't know the brand of the plate. I don't even remember where I got it from anymore. It was yellow with a black border and the pattern was like that of a spiral from the center out. Kind of like an outward ripple created by a drop in still water. One of my goals in pottery class was to make a plate like that. So far, I have not succeeded. Coffee, yep! The possibilities are endless. I prefer savory puff pastries to the sweet versions. Sunita has a spinach and cheese version. Meeta, I'll check out your pesto spirals. They will really go down well for a neighborhood party that's coming up in June. Inji and Shn, take the idea and run with it. There's tons you could do with it! Richa, I forgot to put the timer on this time. I had lowered the temperature of the freezer to as low as it would go (-6F) and then forgot about them. It froze into a rock because of the chutney! Bee, thanks! It was scary especially since my entire family was at home and no-one heard anything. They were out on the patio, firing up the grill and waiting for me to arrive with the burgers. Sigh. Got your email - will reply soon! Mathy, welcome to IFR! Do try these spirals. They disappear in minutes! Manisha, the spirals looks so great. saw this pic in JFI too. great recipe. will make them sometime. This is an amazing dish for entertaining... Looks great on the table. Manisha I understand the challenge in the height department. You have company dear. People say how come you keep dropping things! Good things come in small packages remember:). Hope the tengul is better now. I'm going to try those spirals from scratch. I hope you are fine today Manisha.When did you join my league ? I thought I am the only one going thr' bad spell these days. I spilled tea powder and pepper all around the kitchen on weekend and it took hell lot of time to clean them up. Its good that I keep all the plates in the lowest racks here, otherwise I would have broken them all by this time. Manisha, they looks so yummy. I am definitely trying this. I'm sorry to hear you've had a bad week: photos lost, plate landing on your head... it'll heal; I've never seen plates like that: would platform shoes help? Manisha, this looks similar to the cinnamon roll. But yours is so unique. Thanks for the recipe. Sharmi, thanks! If you come up with your own twist, please let me know! Suganya, welcome! You have some delicious spirals going yourself! I love all the creative stuff you are serving up on your blog! Delicious! Musical, I think the forces that be realized it will take more than a plate on my head to keep me down! Your spinach kadhi might just happen today! It's much cooler today and some more afternoon thunderstorms are expected to roll in. Perfect weather to slurp on kadhi! If the sugar-mafia complains then I will simply place sugar on the table for them to do as they please. I will not give in this time! Tengul has flattened out, Anjali, and the pain should subside in a few days. Today is better than yesterday. I am hoping the weather will hold and that an afternoon walk will help. 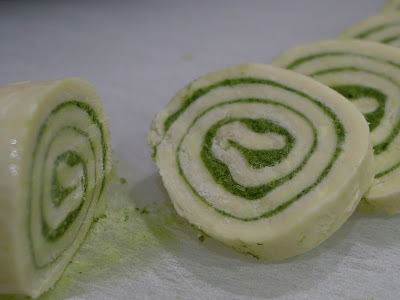 Please post your puff pastry recipe along with the spirals, if you do make these. Shilpa, I've always been right there with you. I drop things. I break things. I cut myself. Life is full of such fun things! I need to rearrange things so that they are like that. But I like all my plates in one cabinet. And I have one of those chrome plate organizers that holds a lot of plates and it takes up the vertical space for two shelves. My kitchen stool was used to paint my old kitchen and is doused in paint so I need to get a better stool and learn to use it! The pastry sheets are a little greasy. But it saves so much time! I used Pepperidge Farms Puff Pastry. It's probably the same one you used. Gini, I have burn marks on my forearms from brushing against the oven. I have had peppercorn in hot oil go splat in my face even though my face is not 'in the pot'! Luckily my glasses have saved my eyes! I have had a burn on my eyelid when I used to wear contact lenses. AV, welcome to IFR and thank you! Cinnamon rolls - that's an idea although I think using puff pastry would make it more flaky than the gooey goodness of a cinnamon roll. But flaky pastry with brown sugar and cinnamon - why not?! Manisha, hope your head is feeling better now! But appreciate your posting the recipe inspite of the aching head. Yes I have had plates drop and break into a million pieces but never on my head though! Spicy Sprials look appetizing. What is the difference between an appetizer and hors d'ouevre (first I should learn how to say that word!). Frenchified appetizer is a hors d'ouevre? 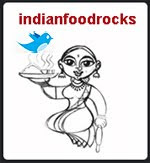 Please Manisha help me here, I write a food blog and not be without knowing these things can I? ISG, when the French can say kozhambu, then you can start worrying about hors d'oeuvre! It means appetizer. A sample pronounciation is here, although I have heard it murdered and said in several different ways, each person thinking that theirs is the right way. Apparently I was lucky that the million pieces happened on the counter and the floor and not on my head. Cos the scalp, when cut, bleeds like hell and needs to be stitched up. I would have been quite the wounded clumsy cook! Right-o! i'll try to find a helmet as well to match; what size shoe do you take? ISG - Hors d'oeuvre is so last Century! You don't need to learn this :-) The new French word to help us along the confusion (amuse us?) is Amuse bouche - I leaned at Sig's blog last month! Actually, it is supposed to 'amuse the mouth' - very cute, don't you think? Don't listen to her, ISG :-D . The spicy spirals are so good, they can't be amuse bouche or amuse gueule. Those teeny amounts they serve as 'amuse your mouth' are a tease. How I wish I had taken pictures of the amuse gueule (another new word, Anita!) served at Charlie Trotter's.But it was a multi-course meal so it was a good thing that it was so teeny. I'm sure Sig has pictures. An hors d'oeuvre is more like antipasto or the meze platter where if you want more, you can have more without feeling guilty about it! Thanks, Manisha and Anita now I learnt 3 new words and I am practising them as I write. Hey amuse-gueule for non-human mouths? yiewwwwwwwww.... (I don't know how to spell yiewwwwwww but I am trying to make that disgusted noise here :)) I still don't get the difference between amuse bouche and amuse gueule!! Manisha, hope the bump is gone now... Lesson learned, always spike the juice! Talking about the vertically challenged, I am with you girl, I have one of those two-step ladders in the kitchen. Now, 6'-2" tankard full of alcohol might be a tad bit too much to handle. Besides being a pain-in-the-neck with you being short and all. You don't want more pain? And you'll have to refill! btw, i coudnt help this joke, pls forgive me if it is rude. Inji- Funny! Yeah those chutney spirals were telling the future! What else do they say Manisha? You see any mangoes on the way? Thank you, Sig, for confirming that those amuse bouche thingees are teeny morsels! There is no difference between amuse gueule and amuse bouche, except that gueule is slang and more tongue-in-cheek than amuse bouche. I think. Anita, don't worry. I have several step-stools - so what if they are covered in paint and not really presentable - and I also have one of these which, if necessary, converts to a scaffolding ladder. So we're set! Just that I am scared of heights. Inji, you are indeed very gifted. You picked up on all the subliminal messages, especially the value pairs in this post. You see a cookie? do you see a strange flutter-by? 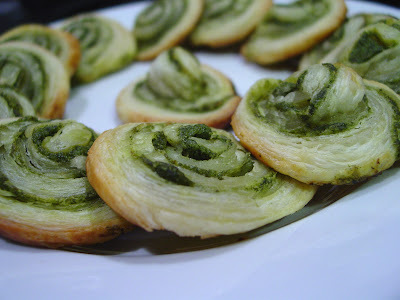 i got very inspired by your green spirals and of course wasnt sure if the ready puff pastry would be available in bombay, so i ended up making my own. This was my first time and i was quite unsure of how it was to be made. but I did make some calculations which turned out right. Also however i did end up with a mess. I didnt drain the chutney, so there was watery chutney all over. then i opened up the roll and gathered all the chutney again and drained it. by then the dough had become soft and squishy. 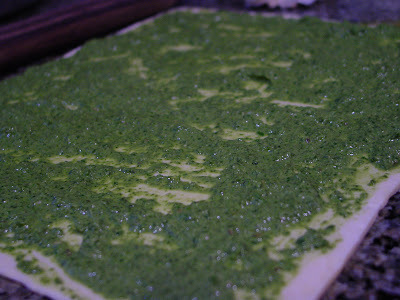 also i added mint to the chutney which i think was responsible for a bitter aftertaste in the rolls. the spirals were good but with less chutney and didnt look as wonderful as yours. Zainab, hats off to you for being so enterprising! I don't think I would have had half your enthusiasm! The first time I had these spirals was at my aunt's in Wisconsin about 4 years ago. She had used mint chutney that she had pounded in her mortar-pestle so it was not watery at all. At the most, there was some lemon juice, that's it. It's the best I have ever had. The mint chutney had mint leaves, green chillies, salt and lemon juice. Too many mint leaves do give a bitter after-taste. Taste your chutney - it should be spicy and strong. If you think it will taste good in a sandwich, you're ready to roll! I, on the other hand, do not have the patience to pound chutneys and I also prefer to make larger quantities. Which means I need to use the blender and therefore I have to add water. So draining the chutney is important. I think I am going to 'bold' that step in the instructions. I use the drained liquid from the chutneys in anything else I might be cooking at the time - dal, veggies, meat, etc. If the dough gets soggy, wipe off all the chutney and chill it. It becomes easier to work with. I haven't yet found my recipe for puff pastry yet. I don't know where I put it. I thought I had unpacked all the boxes last Feb but I guess I don't know where I put what! I still haven't found the drawing of the 5th Power Puff girl! But there are several recipes for homemade puff pastry. I think I will give homemade puff pastry once summer vacation starts and update this post with my findings. And, a warm welcome to IFR! By the way, did any of you Bombayites see the plane yet? If you do, please post pictures!! Dilipbhai, bo yummy che. Try karjo, I am sure you will like them! Oh wow, those look terrific! I will definitely try my hand at them for my next party. I'm sorry about the plate -- heartbreaking, but happily not head-breaking. I finally got around to making a couple of things from "The Language of Baklava," thanks to a nudge from Mom, who is visiting and read the book while I was at work. 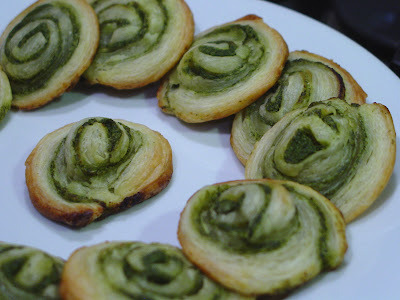 oh lovely spirals ,and with the green chutney its yumm.. 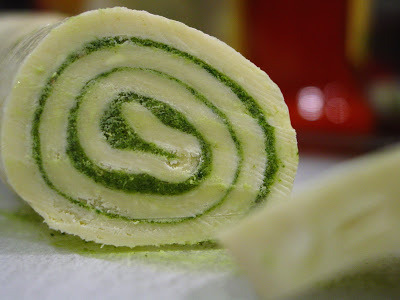 I too have found it bit difficult to handle when its floured and Thawed ,so I also refrigerate before using any ..
well I am still looking for frozen puff pastries in India , If I come across any will definetely post about them ..
hey manisha, nice platter shattering , also palette shattering spirals. ur funny account on being vertically challenged made me less worried about the bump.ur sense of humor only got better from it.feel better soon. kitt, sorry about the late response! I hope you enjoyed your visit with your Mom! Jaya, we're on the same wavelength! Do update me if you find frozen puff pastry in India! Uma, some fancy alliteration there! I was rather worse for wear that week but I am rather like that weed that won't die! Good to see you around again! I tried making the spirals and it dint puff at all, even the sides and the bottom and sides got burnt..Do u have any idea what I could have done wrong? I sprayed some oil spray on a cookie sheet and baked them..Appreciate any input you may have regarding this..
Gayathri, did you follow the directions on the packet for thawing the puff pastry? The temperature, too? Draining all the excess liquid from the chutney is key. It sounds like your puff pastry may have been too soggy to puff up. Also, I don't think you need to grease the baking tray but it depends on the puff pastry you are using, so check the directions on the packet for this, too. Ovens vary and you might need to either reduce the temperature to 375F or even 350F and/or check after 7-10 minutes to ensure that the spirals are not burning. I tried these for one of my lunch parties. It was a huge hit. I stumbled across it while searching something on the web. I forgot to say, I am linking your blog on mine.